Only 1.7 gram fat and BCAA are 5.4 gram and 4 gram Glutamine per serving. 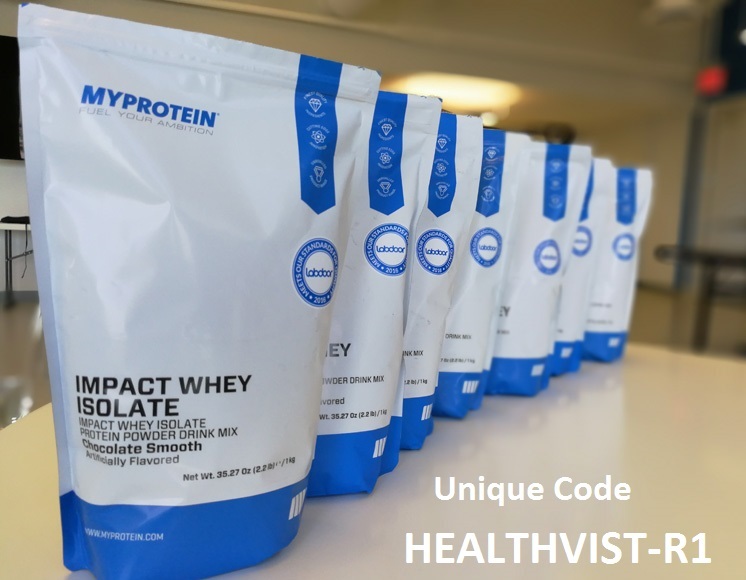 So overall a good Protein Profile and it can be given 8.8/10 in Protein Profile. When it comes to Mixability, it is pretty good at this, it mixes easily even with a spoon in a glass of water or in your favorite beverag and in shaker it's ever better and there are no lumps in the shaker, in short it's mixability is quite good and it scores 9/10 in that. Now it comes to the flavors rating, This Muscleblaze product comes with Three different flavors all flavors are good only, except their new chocolate flavor(very good) which is quite different from other chocolate flavors. In rest of the flavors strawberry is a little better than the other. Vanilla and strawberry can be given 8.2 and 8.5 respectively. Flavors are Mild, not very strong in taste. It comes with xantham gum which is responsible for a thick protein shake. They have recently launched a new mango Flavor, Which can be reviewed after few days. The product comes with Good protein profile and good mixability with mild flavors and it comes with good price too. Not only good gains but easily digestive. Well, Good protein profile is very important and it's present here. Actually it comes in low cost also but remember low scoop counts too and I Must Say that you should compare it properly with other most competitive brands(Like with Ultimate, MuscleTech, Dymatize, MusclePharm), for PRICE PER SCOOP and Extraction Process, Which is actually very important before deciding atleast any protein supplement But overall the product is good for hard trainers and athletes and can be given 8.5/10.and value your money. Thanks for the review, actually I have consumed 2 of it's boxes but not happy with the results and again switched over to Ultimate Nutrition Prostar Whey which runs 1 Extra Month for me and costs me almost same. Hi Rajat, Thanks a lot for reading my article. I think if you are a fan of one supplement, you won't like other supplements or you can easily find glitches in other nutritional supplements, but Yes Ultimate has greater number of scoops(80 servings) in 5.28 Lbs product rather than Muscleblaze which has bigger scoop size that to with 60 scoops in 4.4 Lbs box. I've tried many brands and please don't try to come up with brand loyalty as an excuse ... There are many factors for MB not to be the best ... taste wise not good ... the powder is thicker if u compare to international brands also quality of the raw material (cheese) to make the whey. For example the leading sports supplement companies Optimum Nutrition , BSN, Isopure all buy the cheese from GLANBIA Ireland...which is the top quality chesse provider and has a reputation of the stringent quality check of all products. Muscle Blaze must disclose the source of raw material for the benefit of customers. Also, the container says about the contents and profile of the powder. Well who knows if the product really has this ? Who has tested it ? We are just going by what the company is saying . This is written on the bottom of their container "the profile has not been tested by us and taken from third party sources.". Well ? Also, if u've tried other brands u'll know know what digestibility means. MB produces gastric problems and u'll feel bloated. Please try using for few weeks and u'll know what i meant. Not to undermine MB's credibility but just saying what I felt and ppl, it's not how attractive the cover or label looks, but it's how the product actually behaves is what matters. Hey dev, your knowledge is good on supplements and you are aware about the facts, that's great but my review is clear about the product and completely unbiased from brand name. Muscleblaze should be open about it's import source and not only muscleblaze all other Indian brands should do the same and disclose their import channel which would be fare from a customer's point of view but almost every Indian brand is fssai license approved except Inlife and few others so this can be a deciding factor for most of the customers. 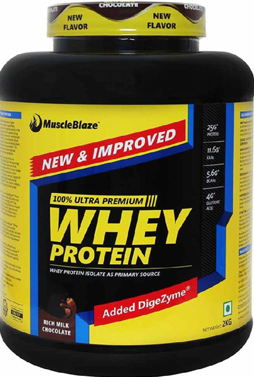 As per price, Muscleblaze import it's raw whey so has to pay duties around 50% that's why their prices are a bit higher and they are encashing their brand name in India too, which other Indian brands are not able to do currently. my weight is 65kg and my height is 5'6 and my age is 21 but I am not bulk please suggest any powder..for gaining more weight and muscle..
You can go for a mass gainer and a whey protein supplement as well for gaining more weight and muscles. For mass gainer you have options like Dymatize, Optimum Nutrition, Ronnie Coleman mass gainer. Thanks bro, if I'll get a chance to review, I'll definitely review MuscleBlaze Torque and it's good that you'r researching on a product before purchasing it but bro do you really think it is costly? I mean it's price is actually very competitive or lower to it's near competitors. With the info that you provided here it looks like you are consuming your supplement for 15-17 days and if it's muscle building it's too early to judge any supplement but if it's fat loss program with any physical activity, you can notice changes but that to when your diet is balanced. In last month I used On's whey protein 2.2lb and after On's I decided to use MB in this month, will this help me same as On's?? Please help? Muscleblaze and ON, both have different extraction methods(Micro-filteration and Ion-Exchange) which results in quality difference, different scoop size and price. (coz Ion exchange is costlier method and one of the best methods today).Now coming straight to your question "Yes" Muscleblaze will help you in the same way as it was with ON gold standard whey protein but the only difference you can feel is, how your system reacts on a different quality whey protein and it's ingredients. Whey proteins(different forms) can be consumed by any age group. Even Infants under 6 months consume whey in breast milk. Hi, is there any kind of side effects for such kind of proteins supliments ? No, there is no such side effect but if you are lactose intolerant( it's a dairy product most of it's lactose has been removed but still it has some) you should avoid it and second condition is like if you can't digest whey protein properly you can try other low fat and low carb proteins for fat loss but whey protein isolate is one of the best proteins in fat loss diet programs. Thank you giving review on muscleblaze whey protein. But can you tell me about MuscleBlaze Whey Protein Pro. Give me review on this protein tell me advantages and disadvantages. Thanks view n review for visiting this blog, whenever I'll get sample for PRO I shall review it. I visited your site it's quite good. Hello deepak and thanks for visiting my blog. You have already taken few of the best supplements in the market.Please refer my latest post I hope it can resolve your query. Bro accha workout and diet hi acche results detein hain, iske liye supplement puri taraf se genuine hona hi chahiye. Thanks Jones for visiting my blog and for your kind words as well. i purchased mussle blaze weight gainer.. i used to take 2 scoop in morning after workout. in one week i couldnt go to toilet, i had digestion problem. i did some yoga and breathing exercise to do toilet. finally when the toilet came it was very hard like plastic or chinwgem and it was bleeding in my anas..i drink lots of mineral water but still faced this problem..than i stoped taking mussle blaze and in 2 days everything was normal.. i would like to ask company why i have faced this..i have taken many products. i have never faced this kind of problem..hope you wont remove my comment..if you do than i am sure this company is fake..
Well manish, if the issue is that much serious you should, na na na, you must consult with a good doctor along with the product level to rule out if any of it's ingredient is interfering with your digestion or there is any some other problem. Please do consult a Doc and get well soon to hit the gym with all strength. Worst protein I have used in my life,It caused pain in my stomach and some liver problems.When I complaint about this to customer support,they refused to accept my return and didn't refund my money.There reply was opened product doesn't fall under return policy but HOW COULD SOMEONE KNOW ABOUT THE PRODUCT QUALITY UNTIL SOMEONE USES IT.ALSO, U PROMOTE MUSCLEBLAZE WITH FAKE REVIEWS ON YOUR WEBSITE.I will never buy MUSCLEBLAZE again .I have previously used international products they didn't caused me pain. If someone want to know more about the Personal Trainer Website I think this is the right place for you!